Disclosure: This is a sponsored post on behalf of Bays English Muffins. All opinions are my own. Our family, like many others, are SO busy. I just don’t know how we get it all done, and quite honestly, sometimes we don’t. Sometimes I forget to pickup certain food staples at the supermarket. Sometimes we are late to dance. Sometimes I just don’t feel like it, but it all gets done. My little guy is a trooper. At just 2 1/2 years old he trekks with me from PTA meetings to work meetings, from the grocery store to his big sister’s after school activities. If I could have just one more of him, I would.. but then I just don’t know how we will manage adding even MORE activities to the calendar! One thing that happens everyday, like clockwork, is gathering around the dinnertable and sharing our stories of the day. Sometimes dinner is breakfast, and sometimes dinner is leftovers, but when dinner is homemade pizza, I can guarantee EVERYONE will be happy. The kids love making their own homemade pizzas and we usually do this on super busy days or when we are running out of ingredients. It’s a great way to make use of any bread you have, like bagels, pitas, or our favorite, Bays English Muffins! I personally like to use a Mexican blend of cheese because it adds extra flavor to our English Muffin pizza, and I sprinkle a bit of garlic powder on the muffins before I add all the ingredients. The sauce I use varies, as sometimes I’ll grab an organic pizza sauce at the grocery store or I’ll use leftover sauce from the week. Once, I didn’t have ANY sauce in the house so I squeezed out some tomato paste, added a bit of water and some spices and used that. Surprisingly, my oldest said it was the BEST pizza sauce she’s ever had! Go figure! Last night we were so strapped for time, we kept our pizza simple. Those who wanted added olives and the rest were plain. 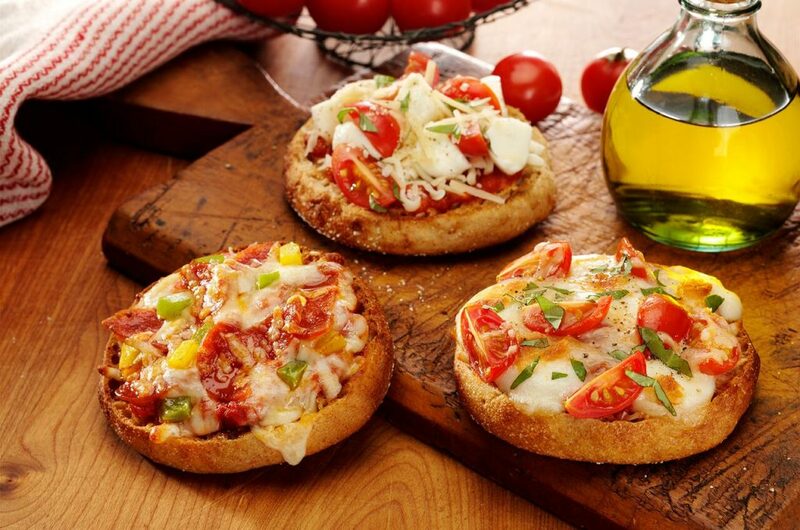 I love the versatility of using Bays English Muffins as a blank canvas to make any variety of pizza our hearts desire. Click on this link http://bit.ly/2nx0hgw to enter every day for a chance to WIN a countertop Pizza Maker Oven and two packages of Bays. 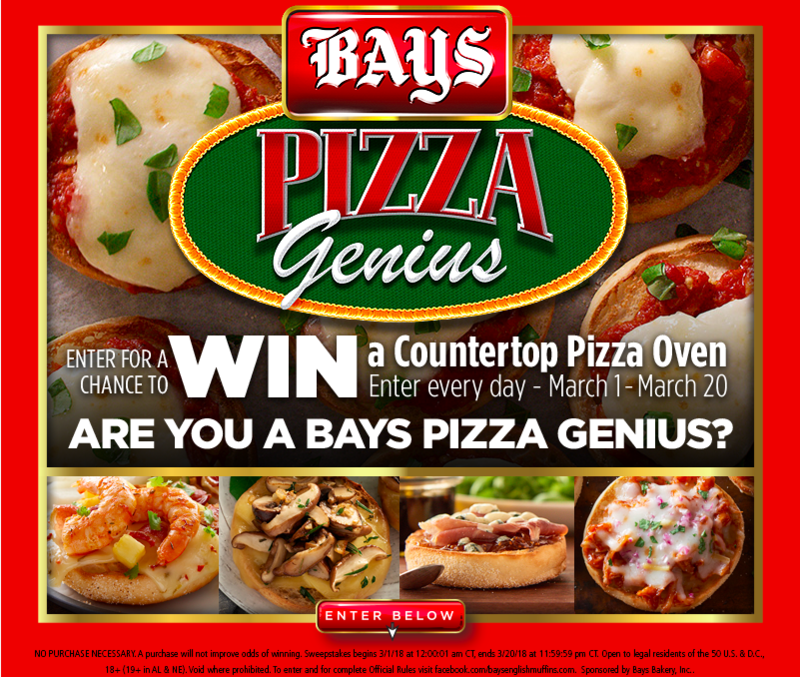 Enter and share why you are a Bays Pizza Genius from March 1– March 20, 2018. The official rules are located at bays.com. There’s no purchase necessary. Place tomatoes and reserved liquid in food processor or blender; blend until chunky. Heat olive oil in medium saucepan several minutes over medium-low heat. Add garlic and 6 of the whole basil leaves; cook 2 minutes, stirring occasionally. Add tomatoes, sugar and seasoning; bring to a simmer. Cook over medium-low heat 10-12 minutes or until thickened slightly, stirring occasionally. Discard basil leaves. Toast muffins; place on baking sheet. Spread with tomato mixture and top with cheese. Broil 2 minutes or until cheese is melted. Top with remaining basil leaves, either torn or Chiffonade cut (See Tip).